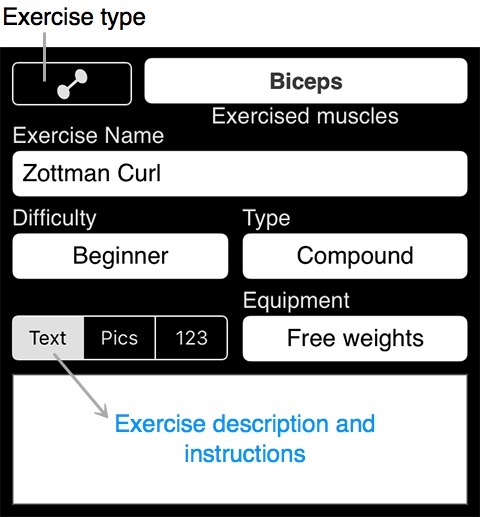 When you see a list of exercises in Body Map or Exercises, tap + button at the top to enter a new custom exercise. This exercise will be added to the selected group, unless you change the group on the exercise editing page. You can also create new exercises when you are adding exercises to your custom routine or to your ongoing workout. Weight is suitable for most weight training exercises. You have an extra option to enter only one dumbbell’s weight for an exercise that uses two identical dumbbells. Tap … to activate this option. Assisted weight is for exercise machines that make your exercise easier. For example adding more weight to a chin-up machine makes your chin-ups easier, because this weight helps you instead of working against you. Body weight exercises – your muscles lift your body or a significant fraction of it. These are exercises like pull-ups and push-ups. Tap … to indicate what portion of your body is lifted. GymGoal allows you to record additional weight, for example you may use a weight plate with your pull-ups. The total weight lifted will be the sum of your body weight and the additional weight.